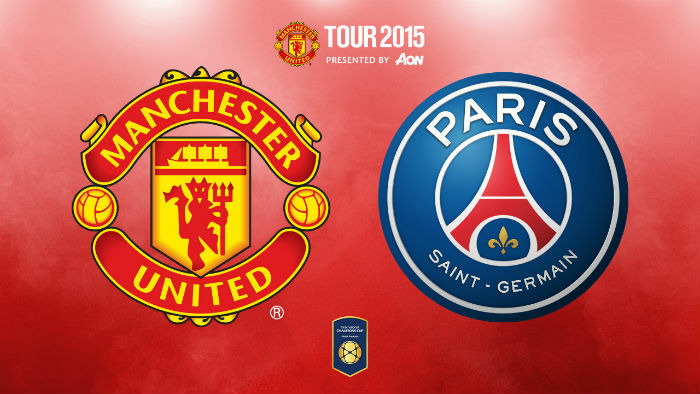 CHICAGO, Sporting Alert – Manchester United will close out their preseason tour of the United States with their fourth game in the International Champions Cup against Paris Saint-Germain at Soldier Field in Chicago on Wednesday night. The Red Devils, who have already beaten Club America, San Jose Earthquakes and Barcelona, will retain the ICC preseason title with a win over the French champions and manager Louis van Gaal will field another competitive lineup, although he’ll continue to feature his youths. One of the players set to start is Bastian Schweinsteiger, who missed Manchester United’s 3-1 victory over Barcelona on Saturday because of a minor injury. Schweinsteiger had featured in the 1-0 victory over Club American and the 3-1 win against the Earthquakes in the second game of the tour. However, the German World Cup winner picked up a slight injury in training before the Barca clash and was held out. Striker Javier Hernandez linked back up with his teammates in Santa Clara on Saturday and was among those cheering for the English Premier League outfits during the victory over Barcelona. The Mexican, who missed the CONCACAF Gold Cup because of a shoulder injury, is back training and van Gaal could give him a few minutes on Wednesday. Meanwhile, Zlatan Ibrahimovic will lead PSG in the contest and they will be hoping to end the North America leg of the preseason tournament on a winning note. The French powerhouses are coming off a 6-5 penalty kick defeat against Chelsea, after the two clubs ended 1-1 in regular time. Ibrahimovic was again on target for PSG. Besides the Sweden star, PSG will also feature the likes of Lucas Moura, who was once linked with a move to Old Trafford, Edinson Cavani, currently being back to join van Gaal’s side, as well as Jean-Kevin Augustin, David Luiz, Lucas Digne, Thiago Motta, Thiago Silva and Maxwell. Prior to the shootout defeat to Chelsea in the last game, PSG had picked up wins over SL Benfica (3-2) and Fiorentina (4-2). Interestingly, Wednesday night’s game will take place in the middle of an ongoing saga involving Manchester United midfielder Angel Di Maria, who has been heavily linked with a move to Paris to play with the French champions next season. Di Maria was supposed to join up with the rest of his teammates on Saturday after the Barcelona game, but the Argentine international never showed up. It was later revealed the former Real Madrid playmaker never got on the plane – with several reports claiming he missed his flight to the United States.